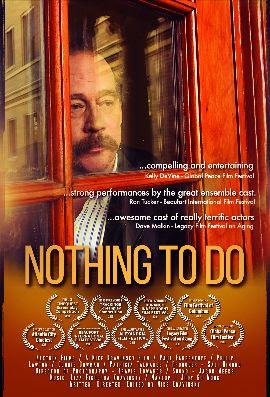 A “compelling and entertaining”* comedy with “strong performances”** by an incredible ensemble cast, from writer-director Mike Kravinsky, "Nothing to Do" on VOD this winter. "Nothing To Do" is the story of 50 something Kenny (Paul Fahrenkopf, “The Wire”), an aimless DJ at an oldies station in Philadelphia. He's called to a hospital in Washington D.C., where he's informed that his father Irv, due to many complications, is at the end of his life. Something Irv has kept from his children. It's suggested that Kenny and his father discuss hospice. Kenny's younger sister, a more accomplished person, tries to intervene. She wants to send her father back to the hospital to "get better." A story of the family bonds that never die, Nothing to Do now available on Amazon in the US and UK, and coming to iTunes worldwide on March 15.